Breakfast Options to Start Your Day Right! 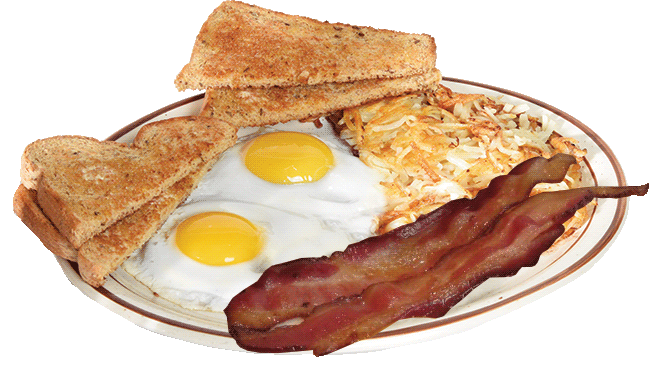 Three eggs, three pieces of bacon, three pieces of toast, with home fries or hash browns. Flatbread is layered with sausage gravy, scrambled eggs and hardwood smoked bacon, then topped with shredded cheedar-jack cheese. 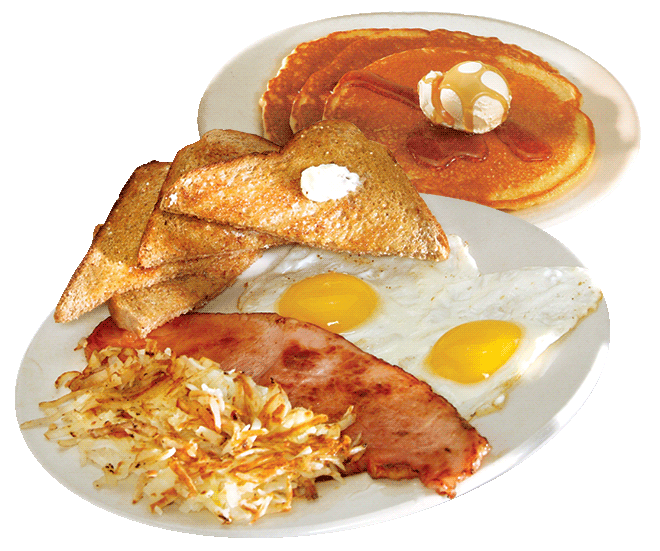 We fill up the plate with 2 eggs and toast, plus an order of hotcakes, French toast or a waffle. Choose ham, bacon or sausage and either home fries or hash browns. A hearty breakfast! 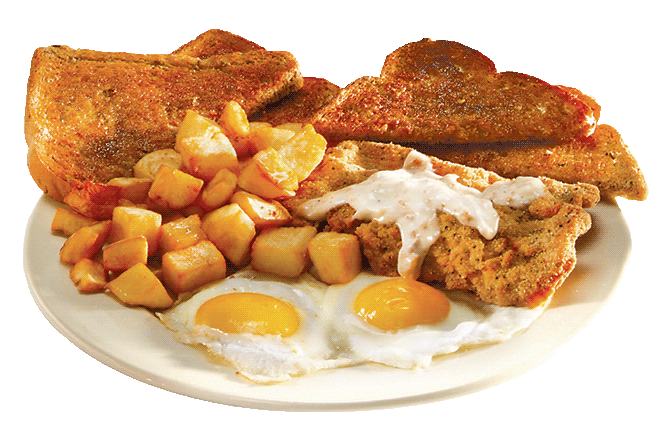 Country-fried steak smothered with sausage gravy, plus 2 eggs, hash browns or home fries and toast. USDA Choice Top Sirloin steak with 2 fresh eggs, any style, hash browns or home fries and toast. A toasted biscuit is split in half and stacked with scrambled eggs, sausage and shredded hash browns, then covered with sausage gravy. Get out the pitchfork! A generous portion of hot corned beef hash with 2 eggs and buttered toast. Two eggs combined with hotcakes, waffle, French toast or a cinnamon roll and ham, bacon or sausage. 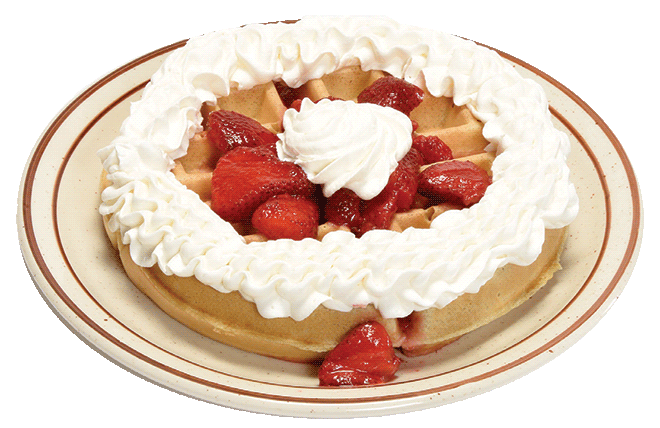 A crisp Belgian waffle topped with strawberries and whipped cream. Stack of three light and fluffy cakes. 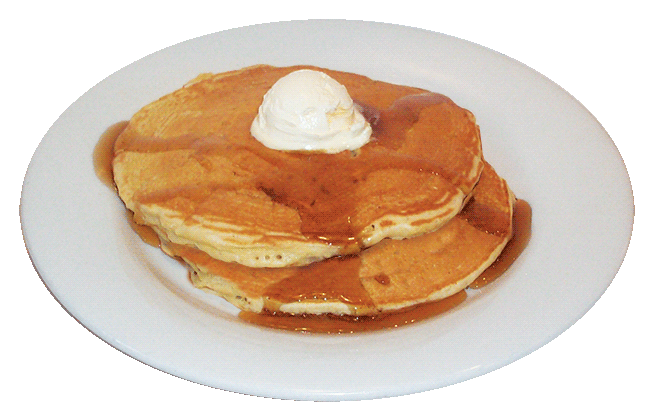 • ADD strawberries & whipped cream for $1.50 additional. Custom-make them with pecans, M&M’s, bananas or chocolate chips for .99 cents additional! Three thick slices made with our secret recipe. • ADD strawberries and whipped cream or bananas and caramel sauce $1.50 additional. *All of our Omelettes are made with 3 fresh eggs and served with toast and breakfast potatoes or fruit. Packed with all the garden goodies! Mushrooms, tomatoes, baby spinach, green peppers and onions – plus shredded cheese! Ham, bacon and sausage are combined with cheese in this meat lovers Omelette. Perfectly whisked and ready to hold your favorite cheese. Choose American, Swiss, Provolone or Cheddar Jack cheese. A classic Omelette with ham, cheese, onions and green peppers. ADD salsa for .99 cents. Choice of bacon, ham or sausage with egg and cheese on an English Muffin or bagel. Two eggs, 2 slices of crisp bacon and 2 slices of toast. Two eggs, hash browns or home fries and toast. Choose plain or wheat and cream cheese or butter & jelly. Oranges, honeydew, pineapple, cantaloupe and grapes. ADD pecans, bananas, blueberries or chocolate chips for .99 cents additional. Freshly-baked cinnamon roll drizzled with gourmet cream cheese icing. *Eggs and steaks are cooked to order. Consuming raw or under-cooked meats, poultry, seafood or eggs may increase your risk of food-borne illnesses, especially if you have certain medical conditions.